Jadielady: Super Happy Awesome Monday!!! So, when I got to work, there was a gift bag on my desk! WTF is this? oooh presents!!! My co-worker Donna gave me some gifts to thank me for being the super awesome person that I am ;) (To be fair, she's super awesome too. I just answer a lot of questions for her because what we're working on is extremely complex, and I've been doing it longer. Anywho, she bought me this super awesome Knitting book, which is perfect for me, because I'm still a bit terrified of patterns. But every last project in this book starts out with a flat rectangle. Rectangles? I can do rectangles! That's just a wide scarf! 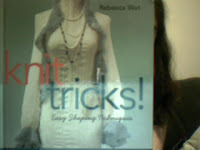 Its called Knit Tricks and its by Rebecca Wat. The second gift requires a little back story. I have this itty bitty tiny tube of Burt's Bees lotion on my desk, which I use very sparingly. 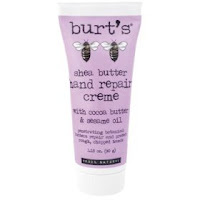 Its basically a sample size that came in a gift set, and I only use it if my hands are super dry, and usually in combination with another lotion. Well, she bought me a full size bottle! 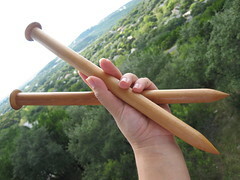 THEN!!! After lunch, my boss asked me to come into her cubicle (Yep, where I work even management is in cubes, though theirs are bigger). I walk in, and see a sheet of paper face down on her desk. She flips it up, grins and lets me know that she's appreciated all my effort in the project I've been working on for like, ever? (really just the last year, unless you count the 3 times I've helped with it before). YAY! I'm getting an award!!!! That was so sweet of Donna. Very nice of you to thank her globally. And YOU ROCK!! on that award. You very much deserve, cause I KNOW.